How we started to refine our marketing email strategy. Plus, an insight into some of the tips we found for creating our first email newsletter. What does it take to get good at email marketing? Like everything else is life, it’s a combination of research, practice and a lot of coffee. Let’s talk about what I’ve done to get myself up to par. I’m not proclaiming to be an expert…yet, but thought it would be helpful to share my email marketing journey thus far. You may find this helpful, especially if you’re just getting into the game yourself. So, the very first thing I did was a generic search for ‘email marketing’. The results were all over the place. I saw some articles regarding examples, but most of the results were actual email marketing software and services. Not quite what I had in mind. Though these sites do have some very useful information. I was more curious in defining email marketing and looking for a way that I could make our email marketing strong. Since I’m more of a DIY girl, I decided to refine the search. I really wanted to tap more into creating a successful email marketing plan myself (for now at least). It’s not that I want to do it all on my own, but I figure it’s best to start this journey with some sort of understanding of what email marketing is. No, I’m not saying I had no idea what it was prior to this journey… but as I mentioned, I’m not quite an ‘expert‘. So, I changed my search and found a few helpful tips to kickstarting our email newsletter. The first thing to catch my eye was an article from CopyBlogger called, 37 Tips for Writing Emails that Get Opened, Read, and Clicked. When I start to do any sort of research, I find these types of lists to be helpful, as they usually lead to other more in-depth articles or provoke another search query. Back to the article, it covered a lot of good general information. General information is always helpful to me as it helps in understanding the bigger picture. In this case, email marketing tips that I should be doing regardless of what type of email it is. You know, be it a personal reach out or a mass email. My favorite section of this article was How to write engaging emails – specifically the tidbit on keeping it short. I tend to be a lengthy writer, which turns out isn’t the best idea for email. Kissmetrics is usually always a great source of marketing info. So, obviously, I had to check them out. Biggest take through with this article is to always ask permission. You never want to send someone an email (especially a marketing email) if they did not ask to be sent this info. It’s a quick way to get unsubscribes and you’ll probably get marked as spam! Alright, so this one is similar to the 37 tips article mentioned earlier. But, it does hit on some great points. One of the top tips I’d say is to design your newsletter to fit your brand. I mean sure, you can talk about all sorts of ideas, but if the message doesn’t reflect you or what the business is doing it may confuse the readers. I spent quite a bit of time on Hubspot just reading their blog. This particular article really hones in on creating content. The first section it brings up is to think of whether you actually need a newsletter. Why? A newsletter should really be there to help you reach a certain goal – i.e retain customers, close deals, gain leads, etc. So after reading a few articles on email marketing, I decided I should look for some sort of class or course to get a more in-depth experience. I really wanted to learn more on the art of email marketing. It didn’t take long… I remembered that Hubspot has a whole slew of free courses. One is actually an email marketing course. The best part is that I would earn a certificate after completing the course and passing the exam. Before I get into the whole HubSpot course, let me explain the main intent of learning all about email marketing. Referral Rock has decided to start sending a bi-monthly newsletter. I was asked to be the ‘voice’ of the newsletter. I was pretty stoked since this is right up my alley. Here comes the fun part… I myself have never written a newsletter. Additionally, Referral Rock has never formally sent out a newsletter. So, here I am trying to start something from scratch. I thought it’d be helpful to post the whole experience, hence this article. Hopefully, this information will be helpful to you whether you simply need a refresher or if you’re just starting out like me. If you’re like me and email marketing isn’t your strong suite, you need to check out this course offered by Hubspot. The Email Marketing Course was pretty eye opening. I had taken a course or two from Hubspot before so I figured that this course would probably be helpful in some way. I must say they did a really great job. The course is made up of 9 sections and in total takes about 4 hours to complete (not including the final exam). 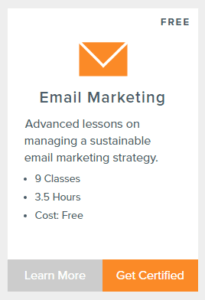 So, I went ahead and started HubSpot Academy’s Email Marketing Course (If I could be a professional student, I would). The course sections cover everything from the email lifecycle, segmentation, deliverability, analytics, and even testing. No, the course wasn’t specifically for email newsletters, but perhaps it will help me on my quest of delivering great emails. Ones that people want to open. Around 2.4 million emails are sent every second worldwide… most are never opened. More than half of the emails being sent are opened via a mobile device – mobile capability is important (Images don’t always work as planned, so have a backup plan). Email testing and optimization is an ongoing process (oh, and testing takes time! )Now, I’m certified in Email Marketing! You can get certified too, just head on over to HubSpot Academy and take the course. I will say the exam is long. But, it isn’t too bad if you use the study guide and really focus on the classes. I figured all of this would come in handy when we start rolling out the newsletter. So onward with the email newsletter. So I had taken the Hubspot course and passed the exam. I earned my little certificate and I was ready to start the newsletter. At this point, I already had a few ideas for the newsletter. As far as how often, what content we’re going to cover, and what the goal of the newsletter would be. The frequency of the newsletter is something that I feel could change later on depending on how much content I’m able to put together. I wanted something that wasn’t too frequent, as I didn’t want to be annoying to subscribers or run out of content. I also wanted to stay relevant so I didn’t want too much time to lapse between newsletters. Which is why I settled for a bi-monthly newsletter, it seems to be a happy medium. Shall we dive into what our newsletter will cover? Yes, of course. We (the Referral Rock Team) had a few ideas on what we want to cover, but the content will adjust to match what we are doing during that specific time (one may focus on referral tips, the next may focus on email marketing techniques, etc.). We really want to be helpful to everyone, and besides, you can only read so much about referral marketing, so we decided that the newsletter will cover marketing. This way, content would be easy to find and it would be useful information for our subscribers. So here’s an outline of the newsletter. Every newsletter will start with a brief intro. The intro will cover what the theme of that newsletter. The Marketing/ Sales Section or the ‘meat’ of the newsletter (which will be called Megan’s Marketing Picks) will cover outside sources that helped us through a specific issue (in this case the topic of the newsletter). Anything listed in this section will be relevant to the newsletter topic. A New with Us Section will explain new company updates (still working on a fancy name). This section will include new articles to our blog, company events, product updates, you know all new things with Referral Rock. We’re going to close each newsletter with an (Action of the Week). This will typically be some sort of call to action(CTA) at the bottom. Whether it be to read an article, sign up for a demo, or just to verify a subscription (like our first one). The plan is simple, I want to cover content that I’ve found helpful or that has helped someone on the Referral Rock team. I also want to keep people informed with what’s going on with Referral Rock as a whole. The goal is to be informative – to all of our customers. Luckily for us, and well everyone out there. There are plenty of marketing and email automation tools to help. We’re actually using MailChimp to create the email newsletter template and so far it’s been great for our vision. Who to send the newsletter to? Since this is the company’s first newsletter, I had to come up with strategy. Luckily for me, we had already been keeping tabs on who wanted to subscribe for more information (thank you Referral Rock Blog!). One thing I learned is to never buy emails or use random email lists. So the plan is to use our current email lists – the one where people have already agreed to receive our emails. This first newsletter will be a formal an opt-in sort of thing. So, the CTA of the first ever newsletter will be to unsubscribe. I’ll provide the whole spiel, “you received this email because you have previously opted into receiving updates” or something along those lines. On top of using our existing list, I figure a good promotion never hurt. 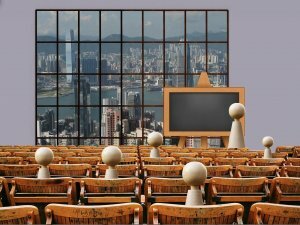 I’ll use some of the promotion techniques that are used for promoting a referral program as those can be pretty universal. I’m sure you’ll be seeing social media posts and other things floating around to subscribe to the email newsletter (on that note, look to the left). What is an easy way to connect to people? Email. People check their email multiple times a day. Especially since many people check their email with their phones and happen to carry their phones around everywhere. The best part is a newsletter can be either formal or in my case an informal, but an informative thing. I wanted to take a light approach to sharing helpful information. My thinking was that most people already have a lot going on throughout their day, my newsletter would act as a mini break. Short, sweet, possibly a little funny, but most importantly to the point.